I know, a lot of you probably thought I would jump on the Steve Mulroy bandwagon. Why? I supported Deidre 4 years ago, because I thought she was the best candidate running then, and I still do. She is as solid a Democrat as there is, I served with her on the SCDP Executive Committee, and I was impressed then with her abilities to manage and coordinate while standing up for those issues that we as Democrats support. She has been involved with large businesses, having served as a Vice President while at St. Jude Children's Research Hospital, and small businesses, working with them for her public relations firm the Carter Malone Group. She has served two terms on the Shelby County Commission, chairing the Budget Committee and the Commission itself. It is one thing to be a good advocate, as Commissioner Mulroy has been, for the most part, and as Reverend Kenneth T. Whalum Jr. was on the School Board. That is what good legislators do, and Deidre did that as well. It is quite another to build consensus, to manage large projects, and coordinate diverse efforts, and that is why Deidre, in my opinion, stands head and shoulders about the other candidates in the Democratic field. Deidre is the only candidate in the Democratic field that can show her abilities in this skill set, the ADMINISTRATIVE skill set, and she will prove why she can defeat Warden, er, Mayor Mark Luttrell in the August County General Election. Look, I like Steve Mulroy, he stands up for a lot of the things I believe in, and he 's a great advocate. I appreciate the Kellogg's campout, it's something that all Democrats need to be involved with, supporting our workers. However, I have a question for him: Do you remember back in October 2011, when Luttrell pulled the Title X funding from Planned Parenthood Greater Memphis Region and got the Commission to approve a contract for Christ Community Health Center, which was about the least-friendly option for reproductive rights for indigent women? Remember how you wound up voting for that, which led to an angry call from me and we talked about it? You even posted your reasoning on Facebook, which appeased a lot of people because you said that you would be able to get oversight for the CCHC operations to ensure that indigent women would get the reproductive services that had been provided by PPGMR. My question is twofold, Commissioner. First, where's the oversight? I don't remember seeing ANYTHING in the CA, the Flyer, the Daily News, the MBJ or the TV stations about any oversight being done. Has there been any oversight? If so, what happened? The second part of the question is this: If you were to be elected Mayor, and the contract came up for renewal, would you support giving the contract back to PPGMR? I think a lot of your potential supporters would love to know the answer to that question. While we are waiting, let's talk about the Reverend Kenneth Whalum, Jr, whom I like and respect as well. He knows how to advocate against something, as his pointed attacks on the poor campaign done by the Memphis Pre-K Initiative sank it. His use of free media overcame the huge sums of money spent by the Pre-K folks, and he was smart about it. One of the reasons that he is in this race, I believe, is that he is upset with Deidre for her support of the pre-K Initiative and for her support of the MCS-SCS merger, which I also supported and proudly so. Yes, the Reverend has screamed about the $57 million supposedly owed by the City of Memphis to MCS/SCS (Shea Flinn can prove that the schools actually owe the city, but I digress), and he was on the Board when that was going on, so what happened? It is also important to remember WHY MCS surrendered its charter. The GOP-dominated legislature was going to allow the then-suburban based SCS to draw a hard boundary and create a Special School District, which would have forced MCS to rely on just the tax money from within the city, which would have starved it to death. (yes, I agree that MCS was overly layered with bureacracy, but that's an argument for another day). SCS would have gotten richer, MCS would have gotten poorer, and the downward spiral would have escalated quickly. Now, since the merger took place, all the schools in MCS receive money from the ENTIRE county as the unified district, while all the folks living in the burbs with their own MSDs have to pay for TWO systems, like Memphis used to do. The problems in SCS now have far more to do with the GOP agenda to force excessive testing on the system in their never-ending attempt to destroy public education. You know that to be true, Reverend, why don't you mention that? You say you want to retire and replace ineffective politicians; I can appreciate that. So why are you opposing someone who has actually been EFFECTIVE? You have to be more specific in your advocacy and you need to tell us how you're going to do this. And all of you need to tell us why Luttrell needs to go, because the media, especially TV, seems be in the tank for him. It's one thing for me to tell people why he runs the county like a jail, but you ALL need to do it. Since I believe Deidre Malone is not only the best candidate for doing just that, by governing this county and working with the Commission to achieve a higher standard, I am supporting her for Mayor, and I hope you will as well. As I noted Friday, even though Senator Kelsey may have fooled the ACLU because he dropped sponsorship, the TURN AWAY THE GAYS bill is STILL in the committee that he chairs, Senate Judiciary. You know the one, Senator Kelsey, SB2566. To paraphrase one of my favorite movie characters, did you think that little farce you played yesterday by dropping sponsorship of this ridiculous, blatantly UNCONSTITUTIONAL bill would fool the LGBTQ community and their straight allies? You have to ANSWER for this bill, Senator. We know that just because Senator Mike Bell of Riceville picked up the Senate sponsorship, it's still going through YOUR committee, Senate Judiciary. Do you think for one second that those of us who believe in full equality are going to let up on you for even a second? Oh, and if I were you, I don't think I would try to make reservations at Restaurant Iris or Second Line any time soon, you know what I mean? The ideology may have changed, for the worse, since Ron Ramsey became Lt. Governor, but bills that don't need to see the light of day still get killed by committee chairs, such as yourself. Kill this bill, and let Senator Bell tell his constituents that it was your fault because you got too much heat from YOUR constituents. You know how to do it, you did it to Mae Beavers last year when she had a clearly unconstitutional bill. Some of the comments in the CA and the Flyer hit a little too close to home, did they? We're still holding YOU accountable, Senator, just like we will for your bill to remove two Shelby County judgeships that are still necessary. Just because you and your $244,000 war chest may not yet have an opponent, doesn't mean you won't face more intense scrutiny, one way or the other. And it's only going to get hotter for you. We've already got a fundraiser lined up, all we need is a candidate. Sure, a good portion of your 31st Senate District may have Germantown, but the district is far more than Germantown, if it comes all the way over to me in Humes Heights. No matter how prostrate you may be to the Koch Brothers, you can be had, Senator. Killing this bill would be a good step, Senator. The gas is on medium heat now, if the bill is not killed in committee, who knows how high it could go? At Long Last Senator, Have You No Dictionary? Our concern is not with the works council and never has been, and Volkswagen knows that very well. U.S. labor relations and German relations are very different. There's some question as to how a works council can be set up in the U.S., and there are various opinions on both sides of the spectrum, one says you have to have a union, one says you don't. But we in no way have been negative relative to the works council. It's really been the fact that the UAW would be the implementing entity. We've even told Volkswagen that, 'why don't you guys create your own union within the plant, if you feel like that is something that is necessary to fully implement this in a way you see fit.' I will say that BMW has implemented its works council without the UAW. I don't think it's much of a stretch to say that this statement alone demonstrates that Bob Corker has no idea how a union works, what unions are for, or why someone would want to join one. 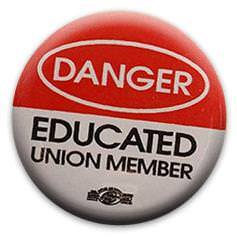 First of all, company unions were outlawed in the United States in 1935. You might expect a U.S. senator to know that already, but in Corker's case you would be wrong. Volkswagen might also expect a U.S. lawmaker who is presuming to tell them how to do business in Tennessee would be conversant in the relevant laws and statutes, and they would also be wrong. It's not illegal. As a matter of fact, I don't want to debate this, because this is a debate for lawyers, but I believe that it's easier to create a German-style works council without a union. Gee, if only the senator had someone handy who understood the law. Most alarming, however, is the senator's apparent belief that Volkswagen can simply form their own union and put all the Chattanooga factory workers in it, as if that neatly settles the matter. It just so happens that Senator Corker is not the only person with inside information, and a source within his office has revealed to me that next on his legislative agenda are plans to put children in charge of schools, give lunatics the keys to the asylum, and beef up hen house security by hiring unemployed foxes. For the record, I am openly and proudly supporting the candidacy of Reginald Milton for County Commission District 10, in which I now reside. I hope that you will support him as well. His record of service to the community is beyond exemplary at the South Memphis Alliance. Please join us if you can this Friday at Red Bar. We're chipping in for Reginald Milton's run in the new County Commission District 10. Please join us.